Wouldn’t you agree that summer demands that you eat watermelon? Enjoying watermelon slices saturated with sweetness on a heat-drenched summer day — YES! Its juicy nature and bright color make it a natural HIT to any outdoor barbecue. I thought of this recipe while grilling up peaches and plums on the grill one night for dessert. I thought to myself “What would watermelon taste like thrown on the grill?” After a quick Google on the subject, I found people do it! I gave it a try — so worth it! Watermelon caramelizes ever so slightly when it’s briefly grilled– who knew? This recipe will serve about 8, a great appetizer to your next outdoor dinner party! 1.) Heat grill. Brush watermelon slices with oil. Season with salt and pepper. Grill watermelon 1-2 minutes on each side. 2.) In medium bowl toss watercress and mint with vinegar. Season with salt and pepper to taste. Set aside. 3.) 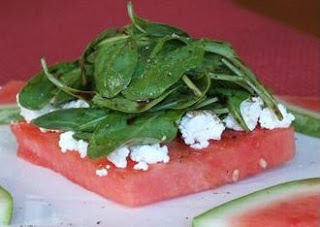 To assemble, sprinkle each grilled watermelon slice with goat cheese. Top with watercress mixture. Squeeze each dish with a bit of lemon juice to taste. Serve immediately.